A bright, unclouded afternoon in San Francisco as a busy plaza teems with people in a sharply impressive telephoto shot as outlying music coalesces with electronic intonations. 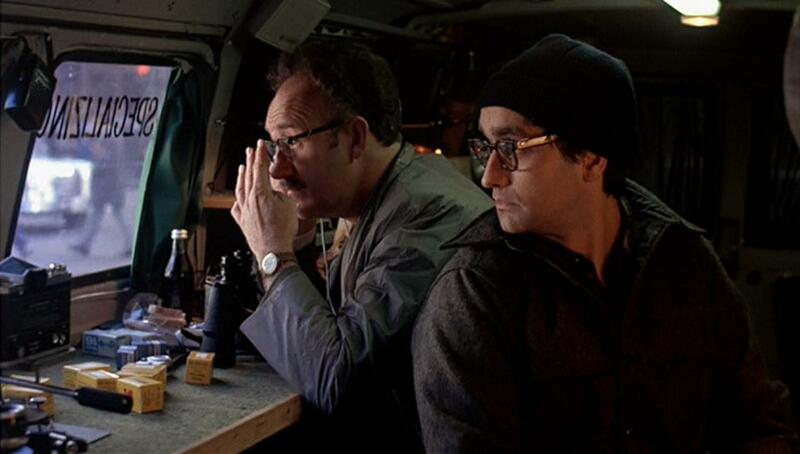 Tracking a circus mime through the bustling crowd before finding one Harry Caul (Gene Hackman), dressed in a plastic raincoat, and wearing a rather unemphatic hearing device, this tenuously nondescript man is the standard-bearer of Francis Ford Coppola’s analytical, Kafkaesque classic from 1974, The Conversation. This opening shot, once the film starts to congregate into sharp focus, is as exact, revealing and concentrated as the screenplay, also written by Coppola, which he considers to be the most personal project of his career. Made amidst an unprecedented swell of creativity, Coppola emerged between the exalted occurrence of Godfather I (1972) and Godfather II (1974), and while those paired epics are nothing to flout, The Conversation, on such a smaller scale, is still every bit as exciting. In fact, one could well argue that The Conversation rivals the Godfather films as far as being a pisstake on the moral disintigration of America. 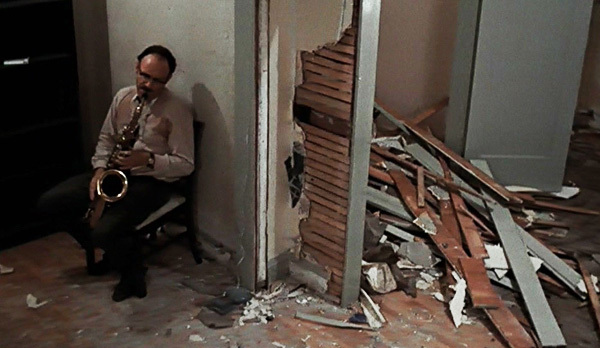 Emblematic of a very 1970s filament of political paranoid cinema, The Conversation made it crystal clear that to observe the world was, unfailingly, to be paranoid. 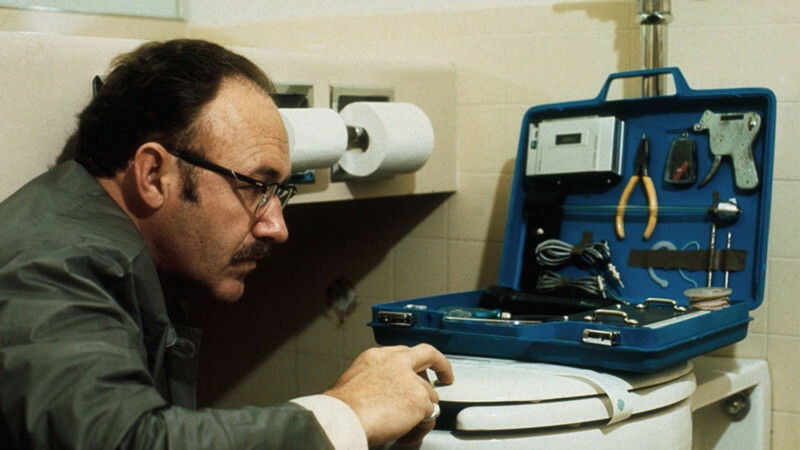 As professional audio surveillance expert Harry Caul, Gene Hackman delivers an exceptionally withdrawn and vigorously internalized performance. Caul is a man who’s much more at ease eavesdropping on absolute strangers from a safe distance than he is socializing with friends in the very same room. A lonely man, he’s coy and painfully pensive; living unattended in an anonymous apartment flat he pays serviceable visit to a mistress who has no other role in his life. This is a very private man, he’d rather sit alone in his scrupulously frugal home and caress his saxophone until his voyeuristic impulses consume him via a snippet of conversation he recorded in the bustling union square starts to haunt him. Similar to the enlarged photographs in Michelangelo Antonioni’s Blow Up (1966), the reel-to-reel audio recordings contain a treasure trove of mystery. Tortured and troubled by the breadth professionalism foists upon him, Caul evinces the investigation. Perceiving a looming tragedy in the midst of his scrambled surveillance recordings, he wants more than anything to solve the riddle, fearing that time is against him. Could Caul’s paranoia be rationalized? Have the voices he’s pick up and scrubbed through the static be plotting some sort of murderousness? Could the only two things he has confidence in in the world––his own eyes and ears––be wrong? Arriving ahead of the Watergate break-in and the scandal that followed, which brought surveillance and double-dealing into the public spotlight, The Conversation, for all of its cynicism and dysphoria, was chillingly prescient and formidably perceptive. What is more, Coppola offers up a searing study of voyeurism that could accurately be called postmodern. Coppola, wisely collaborating once more with editor and soundman Walter Murch, was already busy prepping Godfather II when filming wrapped on The Conversation, so he trusted his colleague to oversee postproduction. Murch’s majestic, multi-layered sound design, an integral ingredient to the film’s overall brilliance, is a cinematic landmark. Fuelled by his own odd imaginings, Caul assembles a terrible truth about the conversation he’s been analyzing, and with each unearthed diagnosis, we the viewer determine more about him. As his exhaustively obsessive investigation collapses all around him what remains? Cau is left with effectually nothing; no effects, no friends, and no reprieve from the crashing silhouette of paranoiac objectifying. Still as stirring and scary as it was when it was first release, The Conversation has aged incredibly well and may even be more relevant––and with a bared teeth realism––than ever before. Appropriated of any identity, Caul’s confusion and distrust of the world around him has made him a moving shark. The few colleagues he has may revere and respect him for his highly specialized skills but what good does that do him? He is, in the end, a burst shell of a man. And this gloriously downbeat denouement is in the illustriously Hitchcockian tradition; duly occurring, but not at all what Caul foresaw. Shattered, he’s now a man aware that the recesses of his heart has been exposed, but by the unfavorable verdict that a serious someone must have planted a bug on him which cannot locate. As the film’s final, fleeting image, it’s a haunting and heart-rending tableau of delusion, desolation and sad ruin.